Summer is embraced by the club as an opportunity to explore the beautiful coastline of the Firth of Forth on organised cruises, depending on weather conditions. Locations can include Burntisland for ice-cream, Kirkcaldy for a bar lunch or even a circumnavigation of Inchkeith - one of the islands in the Forth. Trips across to the Edinburgh side are not unknown. You should come equipped for a day on the water, with eg. water, food, sun cream, appropriate clothing, etc. See the Members Duty Rota for destinations. The cruises also serve as a useful opportunity for members to increase their knowledge of tides, weather patterns and how they affect the day sailor. Members start arriving before 10am to get their boats ready and the briefing on the day is at 10am. You must attend the briefing if you wish to cruise. Safety is, of course, a top priority and the club's rescue boat accompanies the fleet at all times. Two-handed boats (or fast single-handers) only. Each helm must be able to sail in fresh winds. All boats to stay within close view of the safety boat. 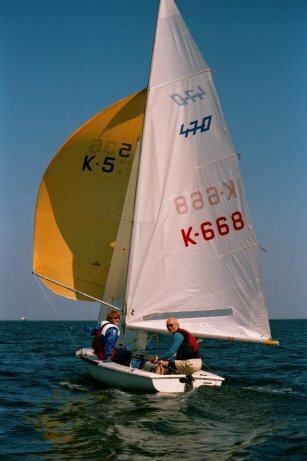 Roy Henderson and Audrey Wallace enjoying near perfect conditions on board a 470 dinghy on the Forth.